This weblog introduces the TADSummit 2014 agenda, shown at the bottom of this weblog. After the success of TADSummit 2013 and the massive TADHack 2014, we are building interest in an essential yet missing component of the Telecoms industry, the telecom application developer ecosystem that creates new services and customer value to address the revenue decline from the commoditization of voice and messaging. The scope is across legacy services, telecom APIs, WebRTC, IMS, communications service platforms, cloud communications, and many other web and IT-centric service platforms. There will be CxO keynotes, as mentioned in this weblog, VP level presentations from most of the telcos leading service innovation, and deep dive work streams focused on solving critical service innovation challenges. The TADSummit sponsors include: APEX Communications, Apidaze, Ericsson, hSenid Mobile, Huawei, Nexmo, Oracle, Solaiemes, Telestax, Tropo, Tyntec, Ubuntu / Canonical, and Voxbone. Satellites: 5 (Sri Lanka, Philippines, Malaysia, Pune India, Chicago USA, and remote). Check out the TADHack YouTube channel to see all the service innovations, and the TADHack photos. And we’re already seeing commercial successes coming from the TADHack entries with Offerhut. The best and the brightest are coming together to help build the telecom application developer ecosystem and successfully commercialize its service innovation pipeline. 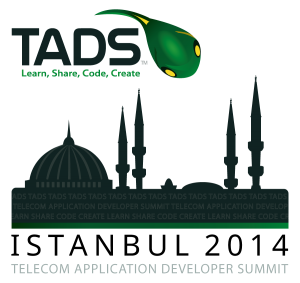 We’ll have the full TADSummit website and registration up shortly. The purpose of this weblog is to share what is being put together, the line-up is turning into a wish-list of the top innovators in telecoms. At TADSummit anticipate 200 attendees, principally telcos, technology providers, and application developers focused on service innovation across legacy services, valium substitute over the counter APIs, WebRTC, IMS, NGIN service platforms, cloud communications and other web and IT-centric service platforms. The event is based in Istanbul to make Middle East operator (no visa required) and European operator (considered EU by most travel policies) attendance easy. CxO keynotes and VP level presentations from most of the telcos leading telecom service innovation. This is a unique event focused on practically delivering service innovation, not just talking about it with a strong business focus. TADSummit is focused on taking the event format back to where it originally started in delivering significant value to everyone involved and critically moving the industry forward. Vendor pitches have little value because of repetition, they’re all available on the web, made at every conference, and made directly to telcos in their offices. If we’re going to spend 2 days together let’s use it to make something happen. This requires much more preparation and effort by all involved, but will deliver actionable insight and get to cash faster for everyone involved. The agenda focuses on two things: Telco Case Studies (new insights) to share learning and best practices; and uniquely facilitated group discussions (Work Streams) to deliver recommendations and actions to enable telcos to compete and survive. In service innovation the greatest competitors are NOT the other telcos, its every other web-based service provider. Competition is intense, disruptive and is going to get much tougher through the rest of this decade. The work streams will be divided into specific case studies and facilitated work group discussions focused on solving / exploring key issues in the work stream. There will be sign-up so people can choose what’s right for them. Each work-group will consist of about 8-10 people (seated around a table) focused on producing a series of recommendations and actions specific to that work stream. Over the next three months we’re going to be discussing each of the work streams online. The fight to remain relevant to customers as service providers is on, and TADSummit is about being a real Summit in bringing the best and the brightest together to understand what is working, what is not, and what we need to do about it. Have a read through the agenda below, please provide feedback, and if you would like to take part please contact me. You’ll be seeing much more depth in the discussions on this weblog on the work streams and lots of high profile names being announced in the coming months.